(CNN) -- Iran's supreme leader delivered an impassioned defense of the Islamic Republic on Friday, insisting a majority of Iranians had faith in the existing establishment and issuing a "religious ultimatum" to protesters to end days of street demonstrations triggered by last week's presidential election. Iran's supreme leader Ayatollah Ali Khamenei said last week's election demonstrated the majority of Iranians trusted the Islamic regime. Addressing a large crowd at Tehran University, Ayatollah Ali Khamenei said the historic voter turnout of 85 percent legitimized the Islamic system and had been a clear demonstration of the Iranian people's trust in the regime. He rejected suggestions that fraud or cheating had been involved in President Mahmoud Ahmadinejad's re-election, pointing out that the 11-million vote difference between Ahmadinejad and his principal opponent, Mir Hossein Moussavi, was too large to have been manipulated by vote-rigging. And he made clear there would not be another election, warning that the consequences of any further violence or public disturbances would be borne by those responsible. 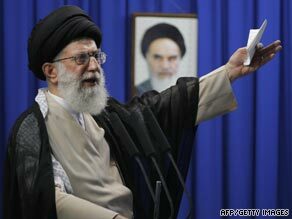 He also accused foreign governments of agitating against the Islamic Republic. Iranian television last night showed so-called "terrorists confessing" to being paid by the U.S. to come to Iran from Iraq and cause violence. Khamenei welcomed the live television debates that had preceded the election, which he said had been vigorous and free with each candidate given a chance to put across his point of view. This was a clear call from the man from whom all power flows in Iran and it will be interesting to see how the situation unfolds from here. Iranian sources say they believe the real reformers -- Moussavi, former president Mohammad Khatami and others -- will listen to Khamenei and pull back to work out a new strategy and new tactics. One source warns that some radicals committed to fighting the regime may stay out on the street. The big question is whether Moussavi will call on his supporters to end their demonstrations -- and whether those on the street will listen.